This is a fictional show, used only as a demo to show you what a "Premium" Show Profile page can look like. In this Overview area is where you would write everything about your show, like: This is our 10th annual show. 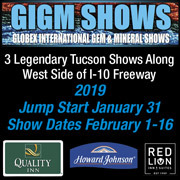 We have over 50 vendors at our show, displaying and selling minerals, gems, fossils and jewelry from around the world. Be sure to contact the XPO Gem & Mineral Society if you'd like to become a member.